We live in a high stress society, and many people turn to food as a coping mechanism, without consciously choosing to do so. 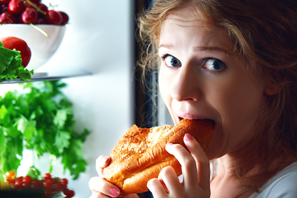 Although many emotional eaters feel ashamed or guilty about their presumed ‘lack of willpower’ over food, emotional eating has much more to do with evolution and biology than it does with willpower. Stress is an inevitable part of modern day living and often times you don’t even realize you are encountering it. When you experience stress, it is perceived as a threat by your brain, and your body automatically goes into ‘fight or flight’ mode. Our primitive ancestors would experience this threatened state when they were encountering an actual physical stressor such as a potential animal attack. In order to escape the attack, they would require the energy reserves that are generated by food. Unfortunately, even though we no longer encounter direct physical threats on a daily basis, our bodies are still hardwired to send-out signals to consume food as a survival mechanism when we encounter stress. To make matters worse, exposure to stress increases your brain’s demand for glucose (sugar) and once the stress has subsided, your blood glucose levels drop dramatically. In an attempt to replenish blood glucose levels, your body sends out strong signals for you to eat, and you can experience insatiable cravings for sweets and carbohydrate-rich foods. Worse still, eating after encountering stress makes you feel better by helping to enhance overall mood, and overtime, your brain can start to associate eating with feeling better. This association can cause a behavioral habit to develop, so that anytime you experience a negative emotion, you unconsciously reach for food to comfort yourself. In our upcoming blog we will explain how to provide your body, mind and spirit with what they need so that you can eliminate the underlying biological processed that cause emotional eating. In the meantime, download our Quick Tip App and check out our tip from emotional eating to lifestyle and how to integrate them into your daily routine. A trusted non-profit guide to mental health and well-being. HelpGuide.org.